To knit more leaf tips! I was obviously experiencing a senior moment yesterday when I knit up four (4!) leaf tips. Four are nice, and worked for the moment…But I need four –per sock!—for a total of 8. Well the first four have been knit in—the heel flaps have been knit (and one heel has been turned! 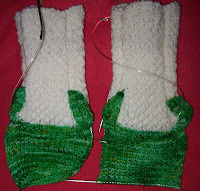 )—the gusset shaping will be placed BELOW the leaf tips--a bit of change--but not really a radical one. See how the stitches from the leaves move diagonally across the upper corners of the flap? That movement will continue –it’s pretty typical of hyacinths to have the leaves to come up and surround the base of the flower head--that is the effect I am trying to simulate. The front tips will move too--and I think there will be a suggestion of a stem-- dead center of each flower—too. 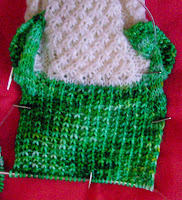 The tips knit up fast (there are just 9 stitches across)—and I can work from the other end of the ball. I’ll need them before I can continue, and begin to work in the round. There is still more finishing to do –isn’t there always? But I like getting some of the finishing started before the sock is finished. It seems like less work that way. I did a different stitch on the heel flap too-- K1, S1—only I slipped the stitch with the yarn in front (not back) –no particular reason.. except I thought it looked better. So today, at work, I’ll knit up 4 more leaf tips. And by tomorrow? Well I hope to have them knit into place—and the gussets started. I must have spring on my brain too. Knit a baby hat with leaves on top. Can't wait to see your finished socks.